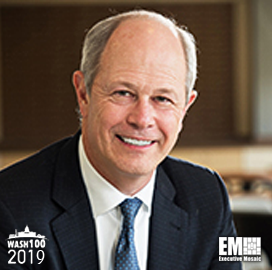 Executive Mosaic is pleased to introduce Kevin Phillips, CEO and president of ManTech, as an inductee into the 2019 Wash100 — Executive Mosaic’s annual selection of most influential voices in the government contracting arena — for his leadership and vision to advance ManTech in cybersecurity, business development and numerous other government sectors. This marks the third consecutive Wash100 award for Phillips. ManTech secured major contracts in 2018 including a potential 10-year, $959M award in July to manage enterprise information technology systems for a Department of Defense agency; and a potential six-year, $668M task order in September to deliver cybersecurity support to Group E federal agencies under the Department of Homeland Security’s Continuous Diagnostics and Mitigation program. Phillips noted that ManTech has supported over 65 agencies for the two phases of the CDM effort for more than three years. In November 2018, Phillips discussed the implications of an increased defense budget for fiscal years 2018 and 2019 based on the need for openness to address the government’s current challenges. “We see a growing desire for new thought leadership and innovation around technology government-wide, and a much broader dialogue between government and industry on how to accomplish mission objectives as partners,” he said in an interview with The Voice of Technology magazine. “We are seeing customers apply strong focus within the space and cyber domains with both policy and execution,” Phillips told investors during Mantech’s earnings call in August. Phillips mentioned the company’s investments in engineering, systems, workforce, business development and acquisitions are priorities to continue supporting growth and make an potential impact in the government contracting sector. “There’s a potential for fiscal 2019 to begin under a continuing resolution, which could have a slight impact on the timing of new contract award,” he added. Phillips joined ManTech following its acquisition of CTX in 2002, and has served across various leadership positions such as chief financial officer, corporate vice president, chief of staff and assistant chairman. In January 2018, he was appointed CEO of ManTech after holding the roles of president and chief operating officer with the company since November 2016. He is a member of the Northern Virginia Technology Council’s board of directors, as well as the William & Mary Foundation’s board of trustees. He spent 10 years with the U.S. Army Reserves prior to joining the private sector.